Are There Foods That Open Up the Sinuses? Vitamins and minerals as well as antioxidants and other nutrients found in many foods offer natural relief for symptoms of the flu or a sore throat. Many folk and traditional remedies are everyday foods you can find on grocery shelves and in your cupboards. Using foods to treat yourself or your family is often a first response to becoming ill; however, if your symptoms persist or worsen, contact your health practitioner. Homemade chicken soup is often a go-to remedy for many acute illnesses. Affectionately referred to as "Jewish penicillin," chicken soup is actually a healthy, wholesome meal that provides many minerals and antioxidants that reduce inflammation, help to lower a fever and lessen cold and throat symptoms, according to “The People's Pharmacy Guide to Home and Herbal Remedies." The steam emitted from the hot soup helps break up chest and sinus congestion. Garlic in the soup provides antiviral and antibacterial agents as well as antioxidant properties. Vegetables provide disease-fighting vitamins and minerals. 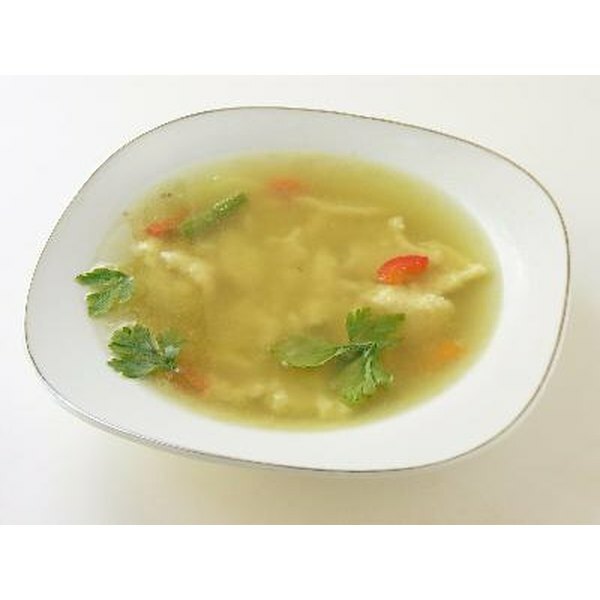 Perhaps one of the most important aspects of chicken soup that helps someone with the flu is that it is made from water, which hydrates the body, especially if the sick person has been vomiting or has diarrhea. Chicken soup is always best when it is homemade because that's where the freshest, most potent ingredients can be added. Do not use boxed or canned stock for your soup. It may contain MSG, wheat gluten and other undesirable chemicals, which are not going to help you get well. A mixture of honey and lemon is an old-time remedy that may relieve your sore throat and quiet a cough. The honey coats the mucus membranes, protecting them against itching, tickling and burning sensations that trigger coughing. Lemon is high in vitamin C and antioxidants, nutrients the body loves for boosting the immune system. Soak a clove or two of fresh, crushed garlic in the honey and lemon juice mixture for an even more powerful boost for your immune system. Ginger ale, when made with real ginger, makes an excellent treatment for an upset stomach, reducing nausea and sometimes helping to stop diarrhea. The best way to use ginger ale is to keep it at room temperature and open the bottle so it gets flat. Then pour some in a glass and sip as needed to relieve nausea and other stomach symptoms associated with the flu. It is also better flat if you have a sore throat because the fizz will not irritate the delicate tissues of the throat. You can also use fresh ginger and make tea by boiling a 1-inch chunk in a small pot of water. Cool and sweeten with honey or sugar, and sip as needed to settle your stomach. Don't use fresh ginger tea if you have a sore throat, as it may make your throat feel worse. The combination of bananas, rice, applesauce and toast is called the BRAT diet and is used for the treatment of diarrhea. All these foods help to bind the bowels, slowing down or stopping frequent diarrhea. If you are suffering from an intestinal flu and are hungry, choose one of these foods to help control your bowels. The toast should be dry, or you can substitute dry crackers. Rice should be cooked and have no fats or other spicy ingredients added. Bananas can be eaten plain or mashed and spread on the toast. Choose unsweetened applesauce over those loaded with sugars and other chemicals. As you begin to feel better, other add other simple foods back into your diet.